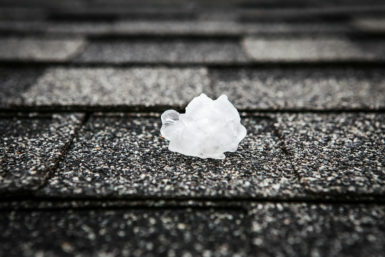 Hail damage can result in leaks and make your home’s roof much more vulnerable to the elements. If you live in the Edwardsville, Illinois area and suspect that hail may have damaged the roof on your home, contact Daech & Bauer Roofing. We have successfully completed more than 10,000 roofing repair and replacement projects in the area, and we are experienced with all types of residential roofing materials, including energy-efficient shingles, slate, cedar shakes, metal, and tile. Once you’ve received the money you deserve, our technicians will repair the hail damage your roof has suffered to return your roof to optimal condition. We will also guarantee our work with a five-year labor warranty, on top of any manufacturer warranties associated with the products we use. If hail damage has affected the roof on your home in the Edwardsville, IL area, contact Daech & Bauer Roofing today to receive expert repairs at a competitive price, as well as the level of customer service you deserve.